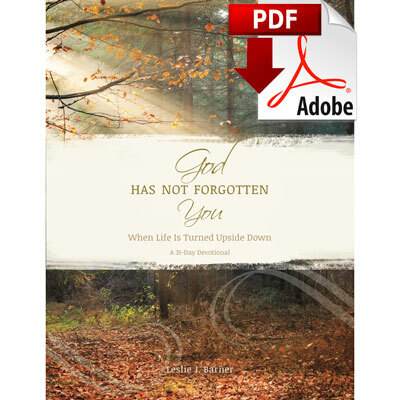 God Has Not Forgotten You includes thirty-one inspirational readings with life application steps to draw you closer to God and to encourage you to rely on Him to bring you safely through this present storm in your life. It can be read daily in thirty-one consecutive days or at your own pace. You are encouraged to work through this resource as a family to help you journey toward healing together and to draw you closer to one another during this difficult time. You can download a free 7-day sample of this devotional here. Leslie Barner is the director of publishing for FamilyLife®, a ministry committed to developing godly marriages and families who will change the world one home at a time. She is the author of several books and is an Ebony Magazine literary award recipient. Leslie and her husband, Aubrey, reside in Little Rock, Arkansas, and have four grown children and four grandchildren.